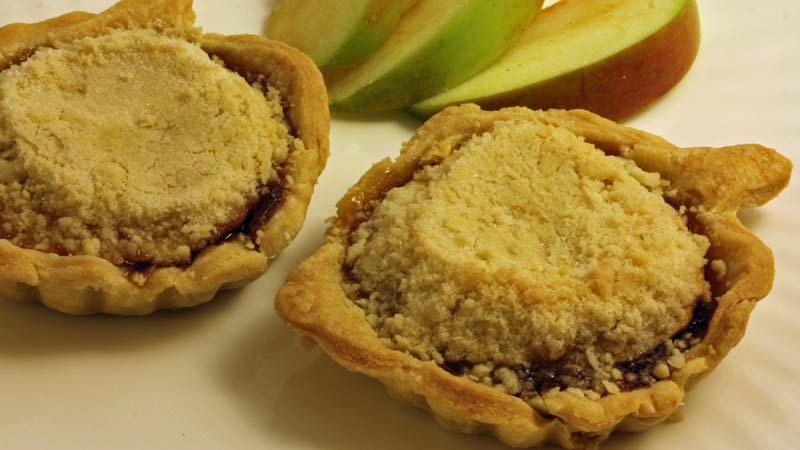 These Mincemeat and apple crumble tarts were a very nice. Enjoyment elevated further with the accompaniment of vanilla ice-cream. These tarts were going to be my first submission towards a blogger food event called We Should Cocoa. The idea is to make something with chocolate each month. This months host challenged readers to create something using leftovers or surplus stock. I have plenty of things in my fridge to use, including nearly empty jars of chutneys and jams, frozen berry fruit like raspberries and foraged blackberries it the freezer, but it was a jar of mincemeat in the cupboard that was calling out to be used. 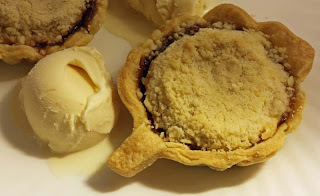 I thought to myself if I did not make use of this opportunity now, perhaps I never would and it would find its way to the bird table in the form of fat balls or worse in the bin, so I decided to make a 'Mincemeat and chocolate tart'. But then my eyes fell on my fruit bowl that nestled some Bramley apples, that I had picked early in the week to make 'Apple and blackberry crumble'. So instead of Mincemeat tart, this tart quickly evolved to 'Mincemeat and apple crumble tart'. When I was about to submit it to the food event, I realised I missed out on including the vital ingredient - Chocolate, duh. Oh well, maybe next month. For this recipe I used 6 tartlet tins and cut the pastry into the shape of an apple using a large apple cookie cutter. You could also make one large one in a 10 inch tart tin. Sift the flour with the salt into a large bowl. Rub in the butter until the mixture resembles breadcrumbs. Mix the egg yolk with 2 tablespoons water and add to the mixture. Mix to a firm dough, first with a round-bladed knife, then with one hand. It may be necessary to add more water, but the pastry should not be too damp. Chill, wrapped for 30 minutes before using. Roll out the pastry until it is 2.5cm/1in bigger in diameter than the cake tin. Spoon the mincemeat into the pastry case and spread evenly over the base. For the topping, in a bowl, mix together the flour and the butter rub the mixture together using your fingertips until the mixture resembles breadcrumbs. Then mix in the sugar. 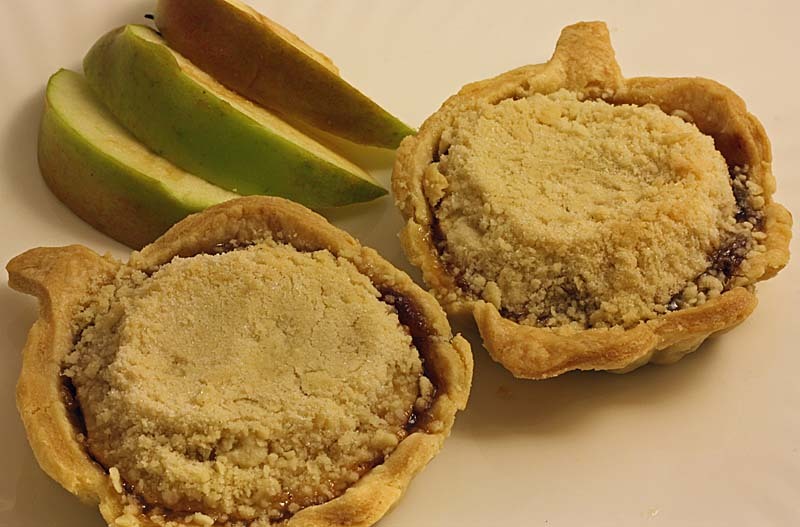 Sprinkle the crumble topping evenly over the apples and mincemeat. Bake in the oven for 20 – 30 minutes, or until the crumble is crisp and golden-brown. Mincemeat crumble tart recipe adapted from here. Sounds great. 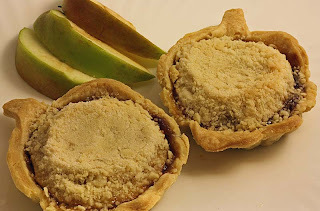 I have a recipe using apples and mincemeat too if you have any left over and want one. 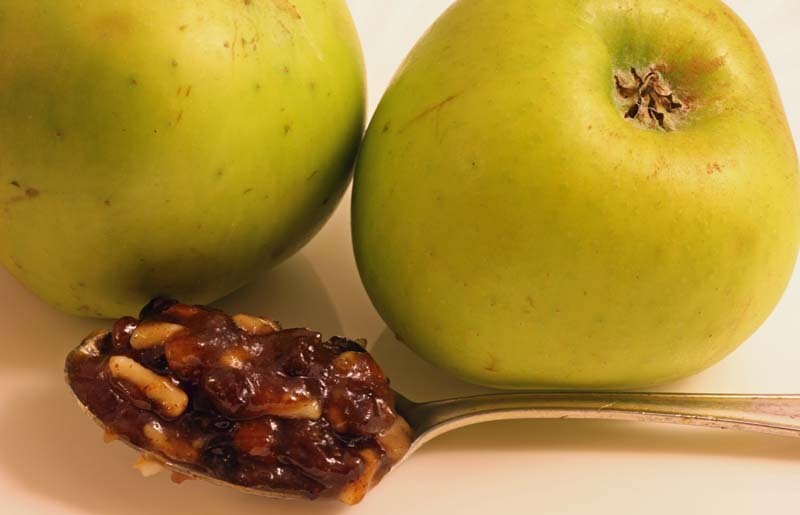 It is called mincemeat and apple round and can be eaten hot as a dessert or cold in slices as an accompianment to a cup of coffee. I love that they are shaped like apples...adorable! Your tarts are so creatively shaped. Great job! Thank you Jane of marigold jam. Thanks Spoonfuls of love, added to every recipe. Clever idea to use a cookie cutter for the base! What a great recipe! They look so cute! You continue to inspire in the kitchen! 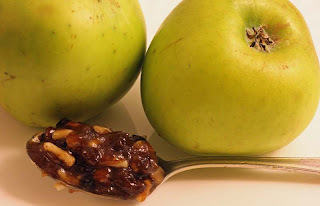 I absolutely adore the shape of them, they sound right up my street, apple and mincemeat, lovely. Shame about not being able to enter them, but as you say, there is still next month. Aw they are beautiful - they look so good with the apple shaped case. I could have cheated by grating some chocolate on top, but I just couldn't do it :( So maybe next time it will be. I'm quite pleased with them. Watch out! I used wholemeal flour and manitoba (wheat flour): they both contain gluten! Hope to see you again on my blog! The Bramley apples just melted...sublime.